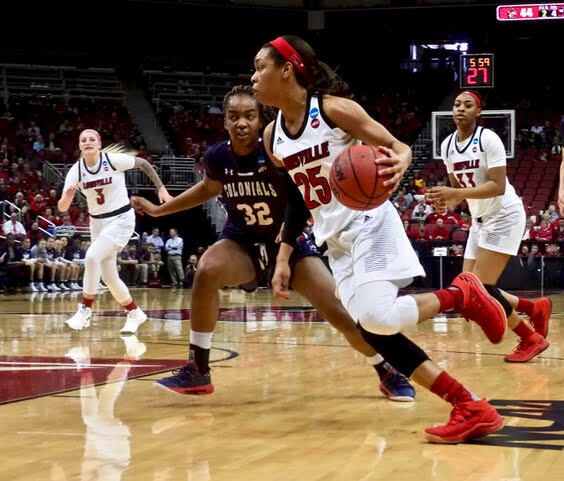 Sam Fuehring in top photo and Asia Durr sharing scoring honors with 19 points apiece in UofL’s opening NCAA win (Cindy Rice Shelton photos). Jeff Walz watching the game on the big screen at a restaurant across the street, having been suspended for comments following the University of Louisville’s loss in the NCAA women’s basketball tournament last season. Not the place he wanted to be but Walz had to be ecstatic following UofL’s 69-34 spanking of Robert Morris in this year’s opening round at the KFC Yum! Center. Robert Morris had no chance. No answers for an intimidating performance by Louisville. Stephanie Norman does her job, winning the opening game in the NCAA. Now the pressure is back on Jeff Walz (Cindy Rice Shelton photo). 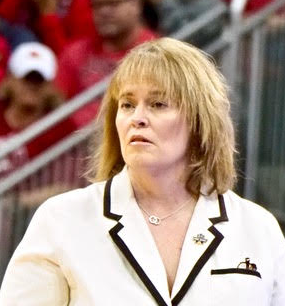 Assistant Stephanie Norman said she felt little pressure subbing for Walz. “He just told us to go out and have fun,” she stated. Louisville made it look easy against the smaller Colonials of the Northeast Conference. At one point between the first and into the second quarter Robert Morris missed 17 straight field goal attempts. 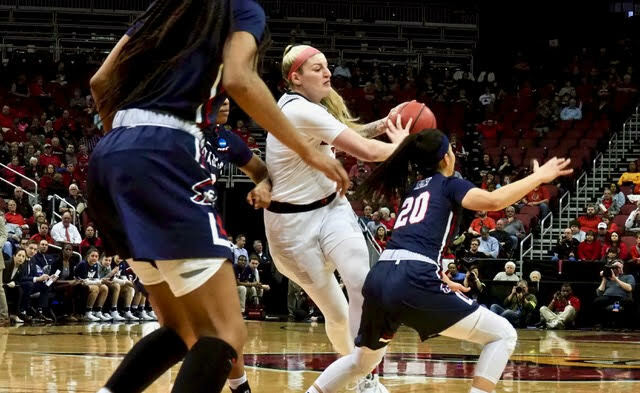 Sam Fuehring following up one of her most disappointing starts in a loss to Notre Dame with one of her best ever games, scoring 19 points and grabbing 11 rebounds. Asia Durr would have 19 as well, resting most of the second half with the game out of hand. Dana Evans added 13 points and Bionca Dunham 10 points and seven rebounds. That and a lot of other things.